Every once in a long while a new field guide comes along to revolutionize and reinvigorate its particular corner of the genre. 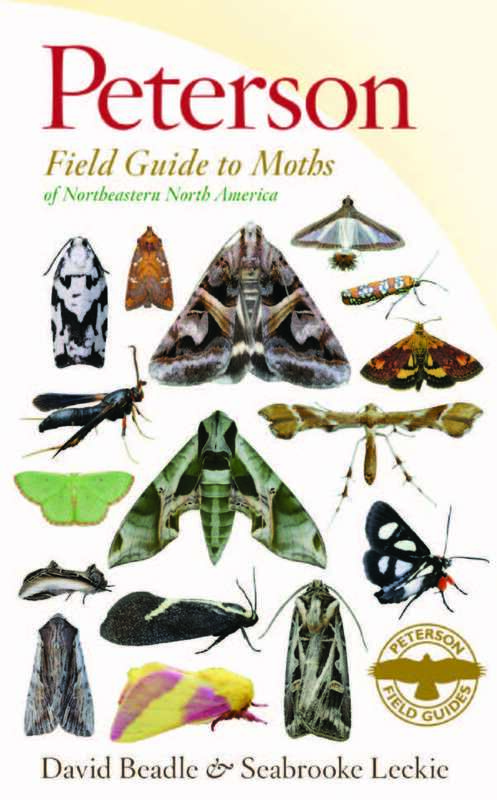 Such a book is the new Peterson Field Guide to Moths of Northeastern North America, just out from Houghton Mifflin Harcourt. Despite the presence of his name on the cover, the author is not Roger Tory Peterson (1908-1996), who helped inspire millions to chase and study birds and wildflowers during a long and distinguished career. Peterson launched the series, but credit for this book goes to its Canadian coauthors, David Beadle and Seabrooke Leckie. Moths, you say? I dare anyone to pick up this new field guide and not have his perceptions changed irrevocably for the better. The photos alone, laid out on the pages as sumptuously as paintings in the Louvre, will change your perspective forever. Maybe you won’t spend the rest of your life roaming the length and breadth of the land, hunting down and scrutinizing moths in the wee hours as the authors do. Surely, though, you’ll pay closer attention ever afterward to a group of animals you’ve probably almost entirely ignored. “More than 11,000 species of moths are currently recognized in North America,” the authors tell us. The number will rise over time as more of us pay attention to moths. By contrast, the continent holds a mere seven hundred or so species of butterflies. How many moths take off and land in the Adirondack Mountains? No one has a clue. It’s probably on the order of several thousand. 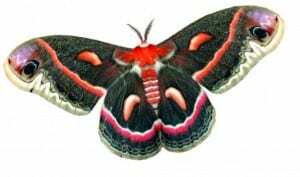 Moths and butterflies form the insect order Lepidoptera and are closely related. Why so many more of the former than the latter? Scientists have only begun to speculate. They can tell us, though, how to recognize one from the other. Night-flying is a clue, although some moths, such as the Virginia ctenuchas common on our property along the Saranac River, fly by day. Better to examine the antennae. Butterflies generally have slender, filamentous antennae with conspicuous knobs on the end. (At least they’re conspicuous if you pay attention to that sort of thing.) The antennae of moths tend to be thicker and lack knobs. In some moths the antennae look like short lengths of string, and in others they suggest ferns or birds’ feathers. Males, which have antennae broader and more elaborate than those of the females, may detect the scent of prospective mates miles upwind. In the Adirondacks, our best known moths are the so-called giant silkmoths. The grandest of these, the polyphemus and cecropia, exceed the size of any of our butterflies and are as boldly patterned as monarchs and red admirals. It’s not hard to provoke interest in moth behemoths, and earlier books rose to the challenge. The towering achievement of Beadle and Leckie is to take all the rest (nearly 1,500 of the most commonly seen species are included in the new book) and make them appear as glamorous and appealing as the warblers and tanagers in Peterson’s famous bird guide. It’s a key point. This book will not only help readers know moths, but it will make readers want to know them. Peterson poured heart and soul into his watercolors, while Beadle and Leckie work with photographs. The authors have built on the work of Kenn Kaufman, who proved in his innovative field guides to birds and insects that photos, manipulated digitally, can rival old-fashioned illustrations in highlighting visual differences. Yet the new moth book raises the bar still higher. It’s been accomplished partly by starting with extraordinary images and removing their backgrounds, and partly by laying out pages with elegant and user-friendly graphic design. Heck, even the range maps in this book are gorgeous. They’re helpful, too. Maps cozy up to species descriptions, so there’s no hunting elsewhere to find them. Black lines on white show state and provincial borders. A cheery Kelly green shows where moths are likely to be found. The maps are tiny but so clear that Adirondack readers will have no trouble picking out which species fly in our neck of the woods. Downsides? There’s a bit of natural history in the opening pages, along with excellent advice on how to lure moths close for appreciation and identification, but this is not a book to teach the reader about the lives of moths. The authors have made a choice to emphasize identification and stay away from the details of the insects’ lives. With so many species to cover, it made sense to narrow the focus and execute it well. One more minor cavil: a tri-colored stripe appears beside each moth’s description. These threw me. I had to search in a “How to Use This Book” section to learn that the stripes represent the three seasons in which moths tend to fly. (Some Adirondack moths also fly in winter. What choice do they have?) An accompanying black line indicates the seasons in which a particular moth may be observed. Consider, for example, the aptly named small birddropping moth and exposed bird-dropping moth featured on pages 388-389. The range maps show that the animated bits of bird whitewash we see in the northern Adirondacks are almost certainly the small, Ponometia erastrioides, rather than the exposed, Tarache aprica. The latter flourishes in warmer territory, ranging only about as far north as Albany. The caterpillars of the small birddropping moth feed on ragweed. Hooray for that. The most handsome of Adirondack moths, aside from the celebrated Saturnids, or silk-moths, are the sphinxes, underwings, and tigers. Of the twenty-six species of moths we’ve recorded on our Saranac riverside property to date, four are sphinxes: the Carolina, the modest or big poplar, the small-eyed, and the one-eyed. Of these the one-eyed, which is violet gray with bold dark markings and pastel pink hind wings (each of these graced by a luminous blue eyespot ringed in black), takes the beauty prize. 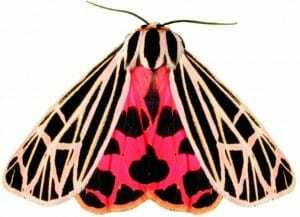 But even it cannot rival the astonishing colors and patterns of the virgin tiger moth. 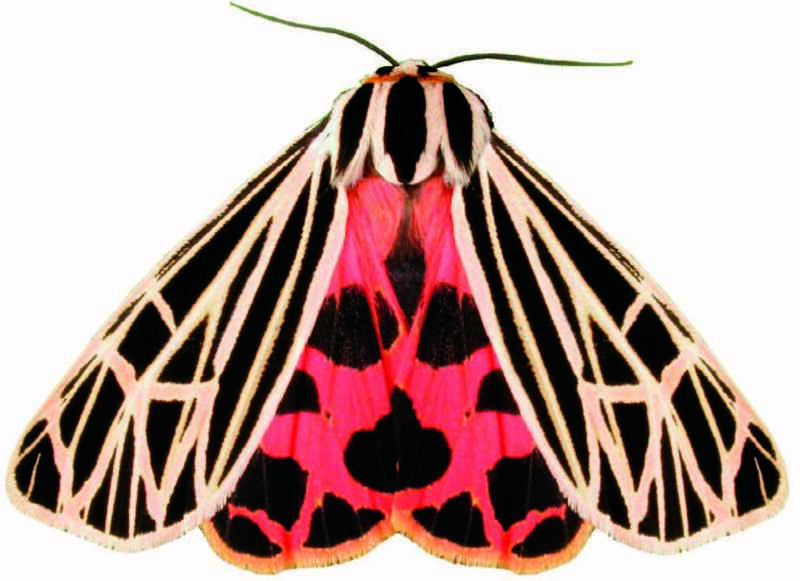 Take a close look at this moth, especially at its flaming underwings. You’ll be convinced forever after that moths can be every bit as beautiful as butterflies. All right. It’s time to get cracking. I intend to make good use of my copy of the Peterson Field Guide to Moths of Northeastern North America this summer. Who knows? Maybe I’ll mix up molasses, brown sugar, mashed banana, and beer, slather it on a tree trunk as the authors advise, and see what beats the bears to the bounty.